COMAU es una compañía de presencia global, con 25 locaciones en 15 países, lo que permite que su oferta se ajuste a una solución personalizada para cada cliente con soporte en múltiples campos industriales. La alta calidad, soluciones innovadoras con impacto en un amplio rango de industrias, incluyendo la automotriz, siderúrgica, alimenticia, petroquímica, militar, aeroespacial y energía. 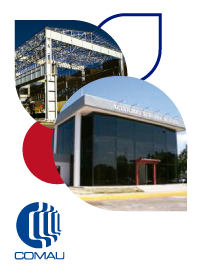 Sus actividades: • Service- obras civiles: servicios de mantenimiento industrial e infraestructura industrial. • System Powertrain: mecanizado, montaje, test • Proyectos especiales: ingeniería, construcciones especiales, prototipos • System Body Welding: soldadura laser, Arc Welding • Cio-Manufacturing: manipulación, monitoreo y control • System Robotics: familia completa de robots Smarts. AUTOMATION AND INDUSTRIAL SERVICE SOLUTIONS. COMAU is a company with truly global presence, with 25 locations in 15 countries, which allows it to offer tailor-made solutions and localizes support in a variety of fields. Its high-quality and innovative solutions have impacted a wide range of industries, including automotive, aerospace, petrochemical, steel, military, alimentary, aerospace and energy. Its activities are service and civils works (specialized maintenance services and industrial infrastructure), system powertrain (machining, assembly, test), special projects of engineering, special constructions and prototypes, system body welding (laser and arc welding), cio manufacturing (manipulation, monitoring and control), and system robotics (complete family of smarts robots).